It is hard to believe! The experts from the department of meteorology have never taken into account the fact that a major war can change the weather pattern. To highlight the failure, the following consideration focuses on the opinion of ten experts concerning the reasons for the extreme war winters of 1939/40, 1940/41 and 1941/42. Seven of these experts were contemporary witnesses, the other three were born much later. One could assume that the list of a few witnesses is selective, but surprisingly enough it is not. Whether named or not, not anyone has said anything about the relevance of human activities in this matter. A link between war and weather was never investigated; in either naval war. Although all recognised that these winters had been extremely exceptional, not even one of them raised the most obvious question, namely this one concerning the role war had on the weather. How can science work with such a big lack of curiosity? How can climatology claim that they understand ‘climatic changes’ if they do not even know the reason why weather and climate deviated at the onset of WWII. It happened under the eyes of modern science. The following presentation of views provides a fairly comprehensive picture of the negligence of science in the “war changed weather” issue. WWII ended 65 ago and science has no idea of what the war did to the weather. This is unacceptable. The first three WWII winters. The honorable Sir George Simpson would turn in his grave if he knew how much he had miscalculated. Not one of the "future climatologists" has made use of Drummond's observation. So it up to this work to present at least the most important observations in the following chapters. b. Stockholm - Bingo! Three-winter record! "After the two severe winters 1939/40 and 1940/41 and the difficulties for seafaring activities and the fuel supplies in the country, they had probably been waiting and hoping that the winter of 1941-42 would be a recurrence of a prior mild winter. Instead, this winter was one of the toughest, if not the toughest of all winters, in the past 200 years. " A few months later he published a very detailed analysis on “The severity of the winters at Stockholm 1757–1942” (Liljequist, 1943), with results any real scientist would investigate until he thoroughly understands the reasons and circumstances. Surprisingly enough Liljequist never considered the cause of very cold winters in a row. Who else had been closer to the naval war scene in the Baltic than he? Nevertheless, his papers proved to be very helpful for my investigation. They gave some sort of support circling around the naval war thesis and encouraged me to search for convincing explanations and evidence. c. At the Centre of Marine Meteorology, but….? Rodewald’s synopsis clearly stresses that something extraordinary had happened, but that is all, which is worth reading, if one is looking for reasons. Although he had been at the center of the weather service in autumn 1939 he did not investigate one of the ‘weather deviations’ during the initial months of WWII, e.g. the weak cyclone activity over Europe or the shift of wind from SW to the NE sector. 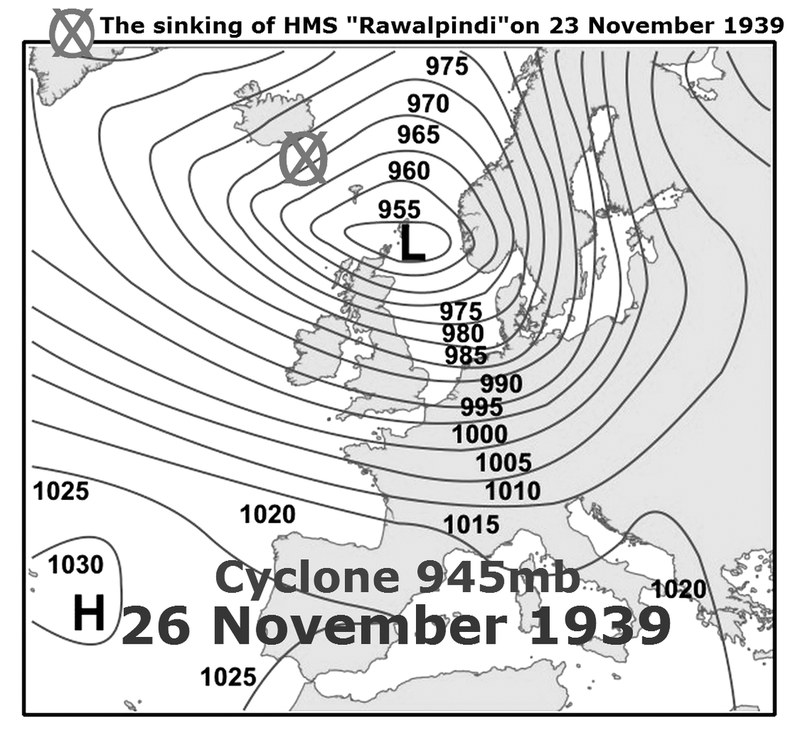 Another example is the 950mb low pressure cyclone over the Orkney Islands on November 26 1939. He was the responsible analyst but did not ask whether that might have had something to do with the first naval battle. On November 23rd the available Royal Navy ships in the sea area between Iceland and Scotland were deployed to hunt down two German battleships and their escorts that had sunk the auxiliary cruiser "Rawalpindi" south-east of Island in an earlier encounter. During this action the air pressure over Iceland dropped fast and a short time later wind force increased to Beaufort 12. 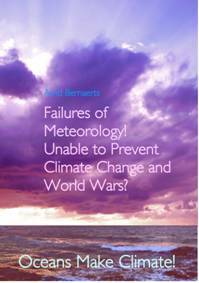 Neither this nor any other of very numerous weather incidents Rodewald picked up for consideration of an impact of war on weather and climate. For an expert contemporary witness with a specialisation in marine meteorology that was terribly short-sighted. This professor from Eberswalde , a small city about 40 km north-east of Berlin , assessed the winter of 1939/40 immediately, but because of his later enlistment in the navy, he could only publish his findings after the war. He mentioned the need to analyse the first war winter in conjunction with those of 1940/41, 1941/42 and 1946/47 as well, but he never did. 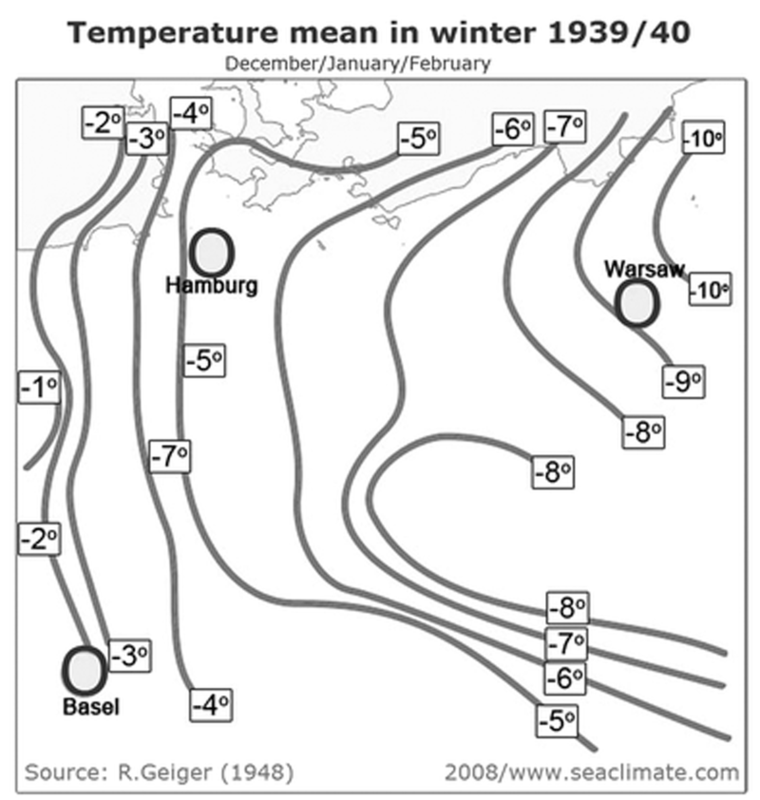 February (1928/29), the temperature level of the first war winter was extremely low during the whole winter, in Northern Germany having six degrees below mean (Fig. A2-10). 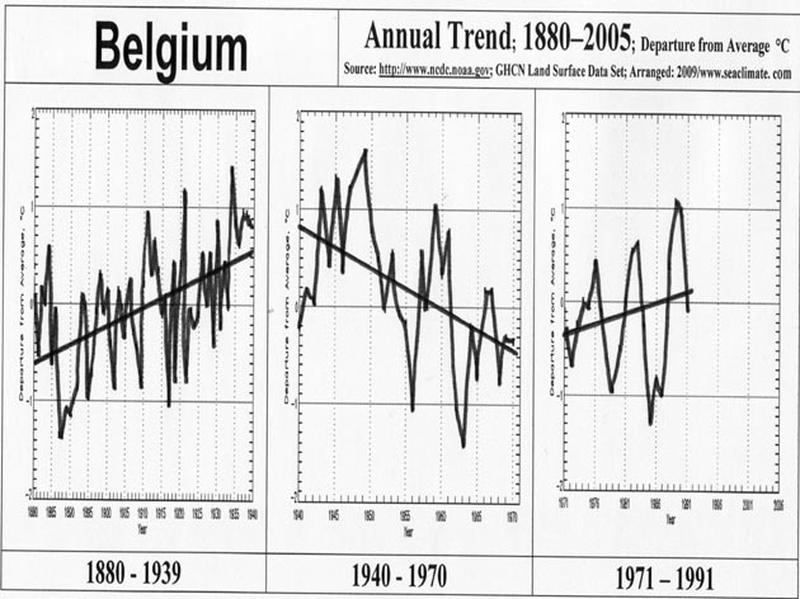 Geiger notes that a deviation of 6°C for a month is unusual, “but for an entire winter it is monstrous”. For R. Geiger it could not have been too difficult to realise that the location and the duration of cold had been particularly severe over the German Bight, Denmark and the Baltic, where enormous naval activities (including the training of naval crews) took place. Maybe the professor had only few opportunities to observe the weather, while serving on a submarine. He wouldn’t be mentioned if it weren’t for two fundamental failures. One is official and on record. In my opinion, it is the fact that he did not search for the reason why his prediction failed. He was a trained scientist, with a doctorate in natural science. He was named the father of all weathermen as he was the one who developed a novel ten-day weather forecasting. He made himself known internationally with a paper on the correlation in meteorology which appeared in 1930 and with one on the significance of the stratosphere. His name is Franz Baur (1887-1977). Nevertheless, he deserves the top spot in this list of experts. Baur advised Adolf Hitler that the winter 1941/1942 would be mild. It proved a tremendous mistake. 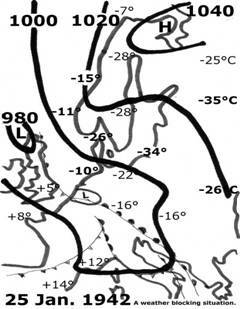 Since November 1941 the weather was the coldest for a hundred years. 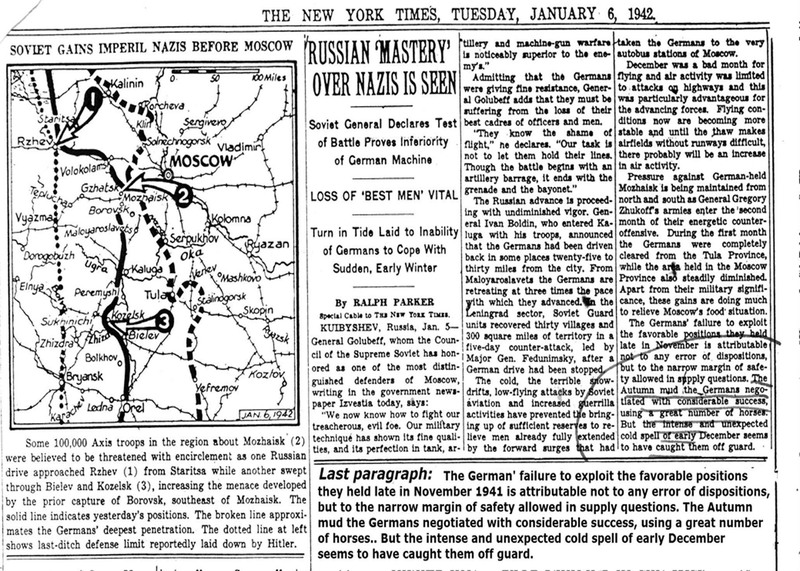 These conditions prevented the German army, as planned, to reach Moscow before the end of 1941. This magnificent blunder was a blessing for humanity, because it marked the beginning of the end of the Third Reich. It also shows how little meteorology understood about their discipline, at least they were entirely unable to draw possible conclusions from the two previous cold winters. Naval war had already contributed to the previous two cold winters! 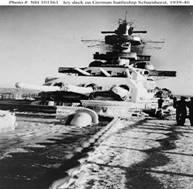 During autumn 1941 heavy fighting in the Baltic caused the weather to respond, but Franz Baur and his colleagues never asked why. Franz Baur in the first place, should have been most ambitious to find out why his forecast failed so colossally, as a devoted scientist would have done. But he did not and failed a second time. LAST PARAGRAPH: The German' failure to exploit the favorable positions they held late in November 1941 is attributable not to any error of dispositions, but to the narrow margin of safety allowed in supply questions. The Autumn mud the Germans negotiated with considerable success, using a great number of horses. But the intense and unexpected cold spell of early December seems to have caught them off guard. 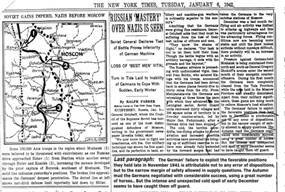 For any armchair strategist, this is a must-read paper on the insufficient weather forecasting prior and during the German ambush on Russia in the second half of 1941. The story fascinates many as the Axis troops faced a challenge from ‘General Frost’ at a magnitude not recorded for over more than 100 years, or even 200 years, depending on the method of selection and interpreting. Let us be blunt! The mere presentation of historical facts made by two outstanding meteorologists more than 40 years after the weather had run amok seems to have little to do with science. Actually, the co-author H. Flohn reports that he was directly involved in forecasting and that he prepared an investigation on the winter climate in the western USSR (see Ref. : p.625) in June 1941 which was based on the series of data from St. Petersburg since 1743. 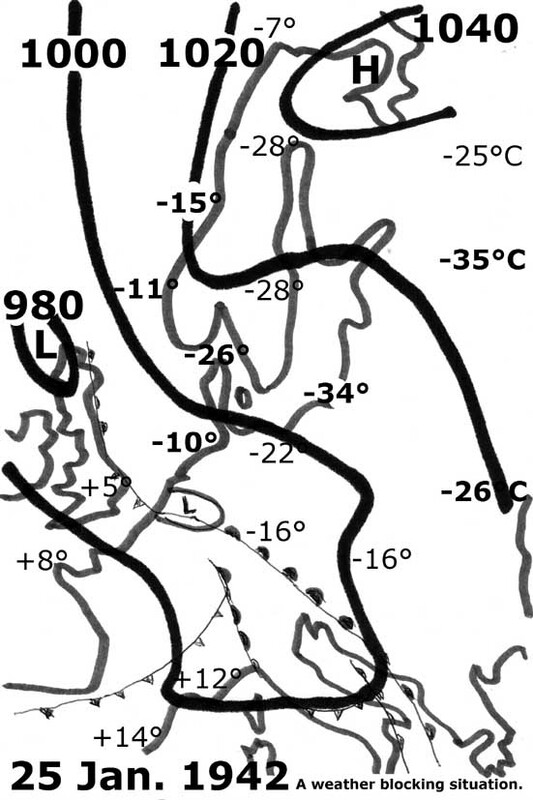 He further mentions that only a few weeks later his department realised that the actually observed “flow of cold polar air masses to Northern Europe ” was like those conditions prevailing in the cold winter of 1939-40 “and which were, in fact, responsible for the harshness of that winter”. Hermann Flohn was called "one of the world’s greatest climatologists" (see: Wikipedia, referring to: Craig, 2005). This title might not be necessarily appropriate to some one, who was involved in the forecasting, but did not ask challenging questions and was reluctant to pursue tough scientific research in order to answer them thoroughly. 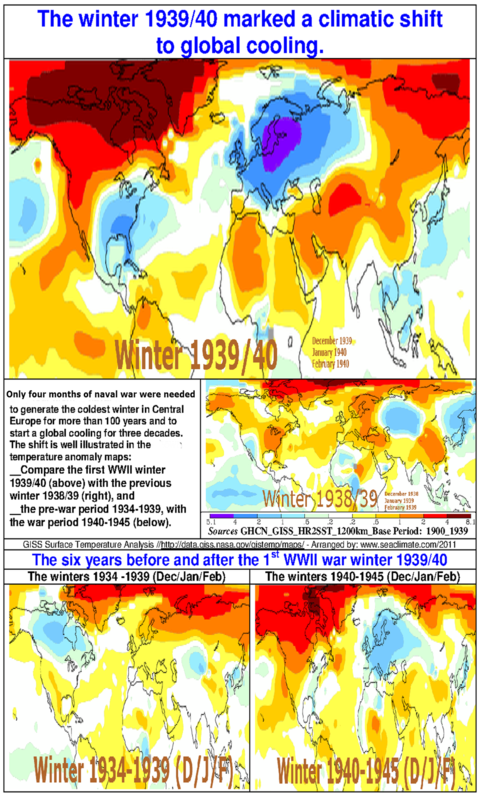 “The winter of 1941-42 is known as the coldest European winter of the 20th Century. The temperature was much below normal from the beginning of January until the end of March 1942. 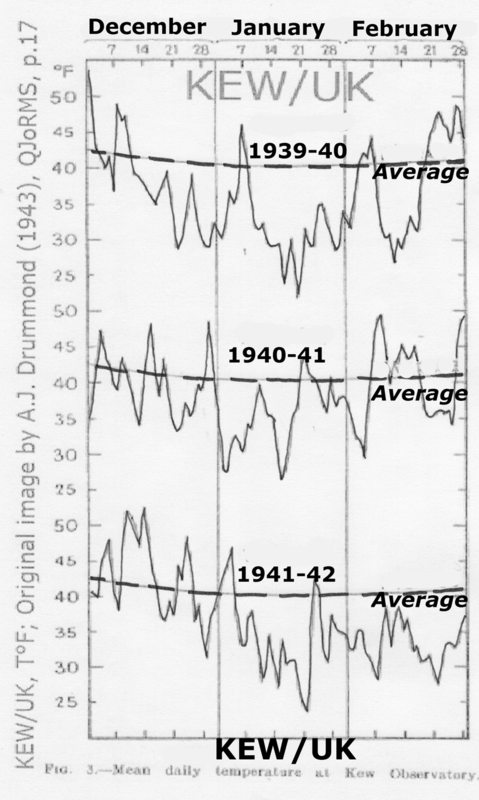 Blockings and cut-off lows were frequent, particularly during January and February 1942. The role of quasi–stationary waves during this winter has been studied by decomposing the 500-mb geopotential height data in a low-pass, filtered, quasi-stationary part and a travelling part. The phase of the quasi-stationary wave was such that a ridge was present over the eastern Atlantic and a trough over western Russia throughout most of the winter. As a result, the majority of migratory cyclones that approached Europe from the west were steered either south toward the Mediterranean or north of Scandinavia . Again, the expert asks how the weather affected the war efforts and not vice versa, i.e. what the war did to the weather. Fig.A2-16; Map used by Palosuo (1953) and Lejenäs (1989) to indicate a strong blocking. The whole situation was so extraordinary that one could have assumed it would have raised scientists’ interest to the highest alert; but nothing happened. There is not even the remotest attempt to ask what generated the cut-off lows and the blocking situations? The answer is offered in chapter C5..
h. Cyclone density changes during the war? A recent diploma thesis by Jonas Bhend established that the cyclone density in the North Atlantic showed remarkable anomalies during the winters of 1916/17, 1939/40 and 1940/41. 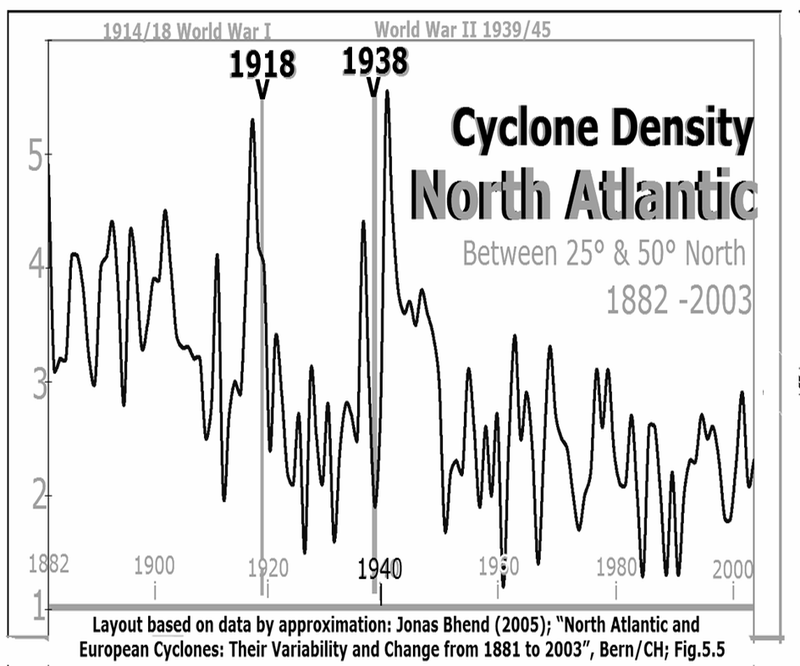 The cyclone density on the other hand, decreased steadily in the North Atlantic sector, from 70° W to 50° E and 25°N to 70°N, during the winter seasons between 1881 and 2003. (Fig. A2-17). Neither he nor his tutors at the University of Berne seem to have asked the inevitable question concerning the two remarkable deviations. The significance of the two World Wars is obvious. Bhend and his tutors did not grasp the scientific importance. “[t]here are many ENSO events that do not show this anomaly pattern. Hence, the generally weak correlations between the NINO 3.4 Index and cyclone statistics over the North Atlantic and Europe lead to the conclusion that the influence of the ENSO on the North Atlantic and Mediterranean storm track is not dominant”. “The influence of the El Niño – Southern Oscillation on the North Atlantic and Mediterranean storm track is weak and non-stationary. However, the strong El Niño event from 1939 to 1942 leads to increased cyclonic activity over the North Atlantic south of 50°N and over large parts of Western Europe. As a consequence of the inconsistent influence of the ENSO, the correlations between the cyclone statistics and the NINO 3.4 index are weak”. The El Niño issue will be addressed in the next section (Brönnimann) and in Chapter F, but here it should be noted, that the peak of high cyclone activities during WWII seems not to cover a period of more than three years (see Fig. above), and concerning WWI Bhend does not even briefly mention anything about an ENSO event briefly before 1918. It is acknowledged that Brönnimann addresses the issue of the extreme WWII war winters. On the other hand he does not discuss any of the extraordinary weather events, nor does he provide any evidence whether there had been a prolonged El Niño phenomenon in the equatorial Pacific in the first place, and if so, that this may have had a very remote influence on the war winters in question, and definitely had nothing to do with the three decades of the global cooling period from 1940 to the 1970s. Chapter F is responding to the claim in detail. For example R Scherhag (1951) and F.B. Groissmayr (1944), whose elaborations will be mentioned in a later section. Baur, Franz, 1936, “The significance of the stratosphere for the broad-weather situation” in Meteorologische Zeitschrift, to which a reply came from: Gilbert T. Walker, 1937, “Ten-Day Forecasting as Developed by Franz Baur” in Quarterly Journal of the Royal Meteorological Society, Vol. 63, Issue 272, pp 471ff.